It’s not going broke any time soon. We'll see Spekulatius. Are you still convinced that the short thesis is broken? 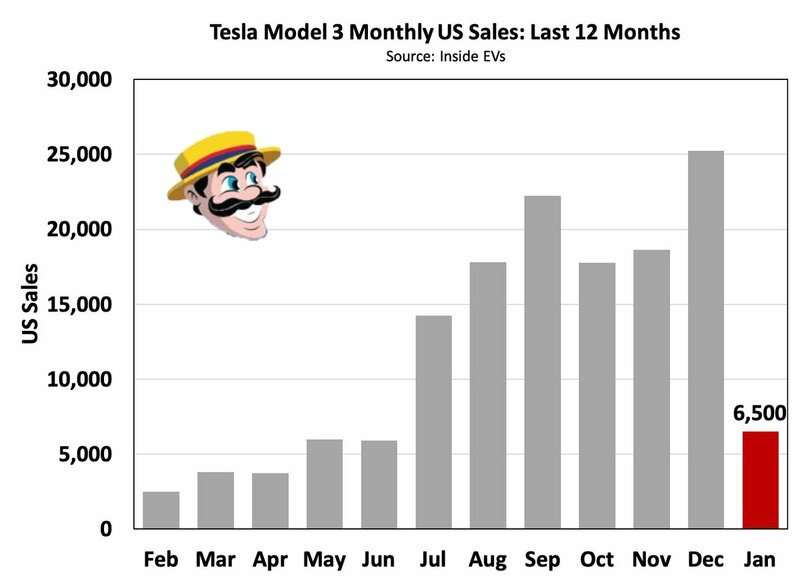 - accounts receivable stayed at the 1 billion level - in Q3 Deepak indicated on the call that this was due to the quarter ending in a weekend and Tesla not being able to cash in the customers cheques. Now the quarter ended on a Monday. 1 billion, that is 15.000 Model 3s at an ASP of 60k. Isn't that the number of missing registered cars? - cap ex was well below depreciation and amortisation in Q4. Is this a growth company? And ow yeah, one more thing, the CFO leaves and is replaced by a 34 year old who has never held the role of CFO. Are they serious? I believe the thesis that TSLA adds a Q to it’s ticket within a short period of time is broken, so in that sense, the short thesis is broken. I would touch the stock with a ten foot pole long however. I agree that the employee turnover is worrisome. For me, puts are simply too expensive to make a play here. For anyone confused by that autocorrect, I think it should have said "Q added to its ticker symbol within a short period of time"
I also agree that I wouldn't take a position in TSLA, long or short, at the moment. I support the company's mission, and maybe one day I'll buy one of their products, but I cannot feel comfortable either way with the stock or assessing its Intrinsic Value. Is there any reason why you wouldn't sell calls then? I mean it makes more sense to be long TSLA vol than short it, but you have that infinite potential loss if it goes stratospheric. I sold some more call spreads and bought a small amount of 200$ puts with the proceeds. I think the time has come for this short to really work. Yes of course, but orders from Europe are around 18-20k right now if i recall that correctly, and it will start as soon the end of february. It just shows that there is no continuous demand. Why shouldn`t europe demand fall off after the first batch of orders are fullfilled either? So maybe they can sell 100k cars per year going forward, but thats it. Thats a far cry from the 300-400k production capacity. And the stock is priced as if they sell 2 million cars profitably per year already. Not to mention that its very unlikely now that they post a profit in Q1 or revenue growth QoQ. And the negative working capital rolling off can hurt them hard on the cash balance.